Anne Todd Guitar Tuition | Classical & Modern Guitar Tuition, Songwriting – Fleurieu Peninsula, S.A. Classical & Modern Guitar Tuition, Songwriting – Fleurieu Peninsula, S.A.
Anne has been teaching the guitar to all ages from young children to adults for over 25 years. She teaches modern (using a pick) and classical (fingers) on any style of guitar : Steel strings, Nylon-­Classical or Electric and lessons include note & tab reading, theory, chords, vocal/guitar and songwriting. Anyone wishing to do practical or theory exams can do so through Anne with A.M.E.B. –Australian Music Examinations Board, Trinity Guildhall of London or Australian Guild. Anne is also a member of APRA (the Australasian Performing Right Association). Anne comes from a very musical family of 9 members who performed during the 1970’s as ‘The Hughes Family Singers’ at many community events, concerts, weddings, Various Television shows including New Faces, Saturday night Live and the Telethon appeals. One highlight was appearing with John Farnham at Cheques Theatre in Adelaide. Anne has studied music with various private teachers and at the Flinders Street School of Music in Adelaide having done a 2 year musicianship course, Theory of Music, Grades exams with A.M.E.B. and Trinity Guildhall of London. 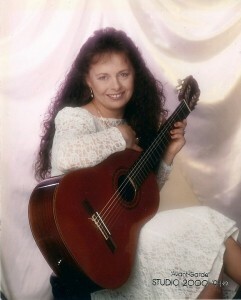 She is currently studying for the Associate Diploma of Music in Classical Guitar. Anne participates at the Sydney Guitar School in January at the Prestigious Ascham School Music Department at Edgecliff with artistic Director and guitarist/composer Richard Charlton. In 2011 she also attended Guitar France at Bagnoles deLorne in Southern Normandy with Artistic Director Gary Ryan, Craig Ogden and Gordon. Students will have the opportunity to play in Ensembles, at various community events, concerts etc. gaining valuable interactions with other guitarists and performance experience. Guitar Workshops with visiting teachers are available from time to time. The love of the Guitar is paramount to Anne and what she wants to pass on to her students.